As a Microsoft Partner I am often required to attempt to navigate the appalling Microsoft Partner websites (services are broken in to multiple loosely couple travesties of web design) and I almost always received errors when I try to do anything other than login (although logging often generates an error too). This post is simply a rant for therapeutic reasons so if I ever meet Steve Balmer or Bill Gates I don’t reflexively punch them in the face. The worst thing is, I’ve had this when I’ve been using Internet Explorer 11 AND I have added the website to the compatibility view settings. All this messing around just because their developers are incapable of doing what every developer of major web based applications does: making a standards compliant website that is cross-browser compatible. There was an error when we tried to process your request. We apologize for the inconvenience. Hey at least they apologized – I’ll keep trying. I spent 25 minutes entering a customer reference on the original Microsoft Partner Network website (the one built in the 1300s by Robert de Bruce of Scotland), on the final page I hit submit and nothing happened. Squat. Nada. Great work Microsoft, more of my time wasted due to Microsoft Web Developers’ incompetence – I’m guessing I’ll have to use Internet Explorer. All I wanted was a ‘Instructions for Earning a Competency’ page but instead I have Microsoft asking me if I’m ready (How do I know?) or asking me to join something (but I don’t know what). I choose the later hoping its something like ‘Competency Program’. Next despite suffering through the painful process of signing in and clearly being told I’m signed in, I am asked to sign in – seriously? What? All I wanted to do was sign up to Office 365 or Exchange for some of my customers. 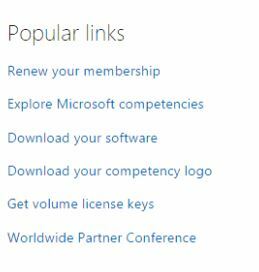 Microsoft told me I needed to earn a competency, I followed their prompts and now seem to have signed up to a second Partner account. I truly don’t think they could make it more difficult to sell their cloud products if they tried. Please help us! I too have spent days trying to find how to sell o365. I have spent so much time on this that I am already losing money on this client migration and I don’t think i will come out ahead at this point. Very frustrating….